Paper maps are coming! The council-produced maps were last updated in 2008 and can be found online (linked from the maps page on our website) but are now out of print as well as out of date, so we've started producing a new map from OpenStreetMap/OpenCycleMap. The draft has been shown at some rides and the evening meet. It should be available soon, either at cost or crowdfunded. Watch this space! And www.KLWNBUG.co.uk/about/maps/ ! Elections are coming! Borough/district and parish council elections will be held on 2nd May. We would like to ask candidates what they will do to help cycling. Most councils now have fine words about cycling in their policies but only a few are doing much to help in practice. A few (North and South Wootton and their park committee) actually hurt cyclists. So we want to ask candidates, but to do that, we need to know who they are. 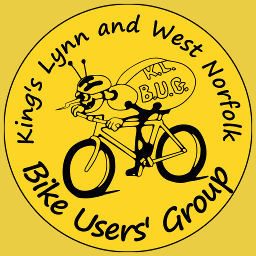 Once you find out who your candidates are, please log on to www.KLWNBUG.co.uk/space4cycling/ and tell us their details. Special Rides are coming! We're going to try "Bike Train" or "Bike Bus" style rides to Fakenham Races and the National Championships - join us at any stop. The May Day weekend is a doubleheader of the Welly Ride on Saturday and the Reach Ride on Bank Holiday Monday again - and a rush of blood to the mouth in the bar last month sees London to Lynn scheduled for the longest Saturday. How many of you will be ready for 111 miles by midsummer?